One of my readers recently turned me onto a dish called “Mimi’s Sticky Chicken“, and I was immediately intrigued by its foolproof technique and the mid-1990s feel of Mimi’s website. So I gave it a try, and I liked the recipe enough to share. This recipe is unique in that it only needs one dish (I used a cast iron skillet), and it uses a relatively low cooking temperature of 250 degrees. Sure, it takes four to five hours to cook the bird, but it’s worth the wait. Gently rinse the chicken in cold water and pat dry. Combine all of the dry ingredients and rub all over the outside and inside of the bird. Place in a ziploc bag overnight. The next day, preheat your oven to 250 degrees, cut up your onions and place them in the chicken’s cavity, then place the bird breast-side-down in the skillet. Cook the chicken for four to five hours, until golden brown and the inside temperature passes 155 degrees. After the first hour or so, be sure to baste the pan juices over the chicken every hour. I recommend you remove any liquid from the pan that accumulates to over 1/4″, to prevent the chicken from getting waterlogged. 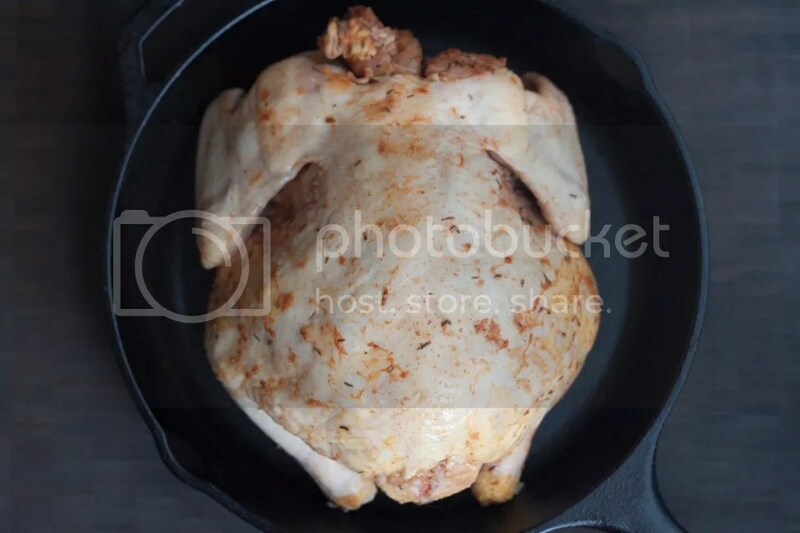 Once the chicken is ready, remove it from the oven and allow it to rest on a cutting board for 5-10 minutes before carving. I use the term “carving” loosely, because this bird will basically fall apart into delicious, bite-sized pieces. I think Paul Jaminet’s interpretation of the diet is best, which you can find by googling “Perfect Health Diet”. Hope that helps! Yes it does! :) Thank you, I’ll check it out. You can do this in a crock pot on low sitting for 4 to 5 hours as well. 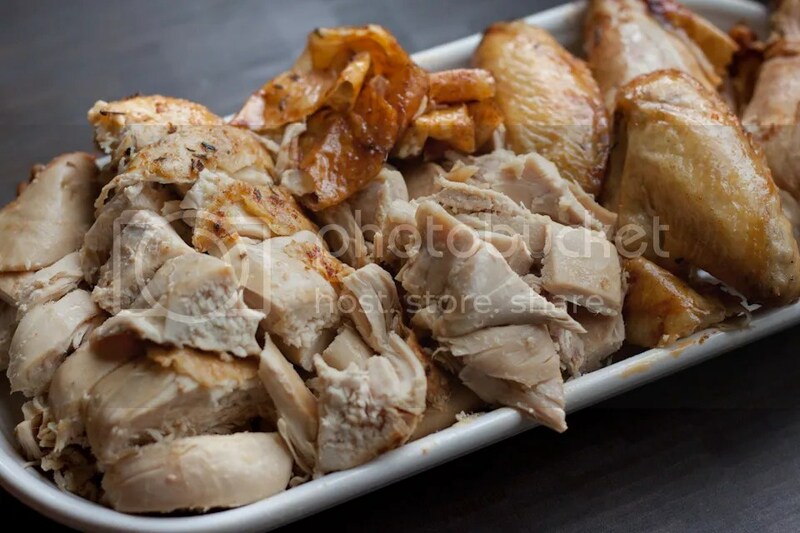 Place chicken on top of cut up onion NO need to add water and cook… taste even better! Mmmm looks gorgeous! I’m scared of the delicious skin getting stuck to the pan- did you grease it up? Right on, can’t wait to try it out! 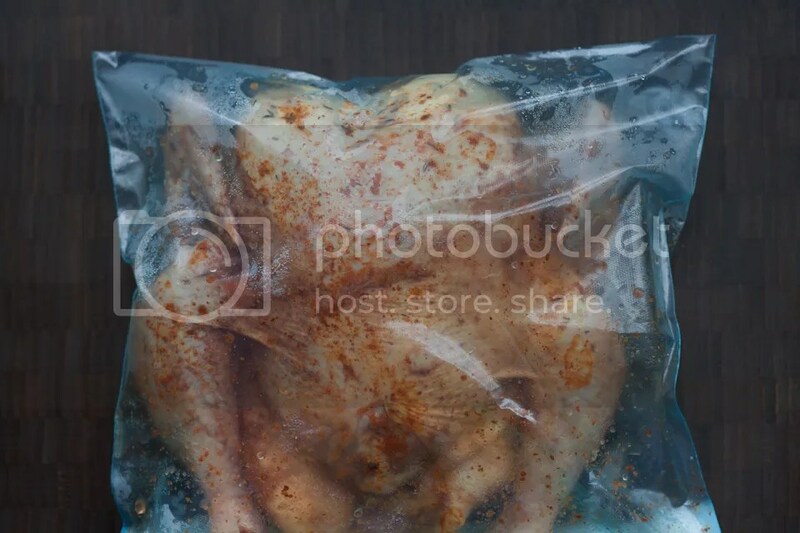 Russ, Is there a decent way to marinate without using plastic bags? Call me a green hippy but one use zip locks drive me up the wall. Andrew, how about a vacuum marinating container? I realize your post was 8 months ago but felt compelled to respond. Ziploc’s don’t have to be ‘one use’. I often ‘wash’ mine with dishsoap and hot water, let dry and reuse. Might not be used for food storage the second or third time around, that all depends on what type of food was in it the first time, but I definitely get multiple uses out of those bags. Chicken is looking good for dinner. Not enough time for this recipe though. It looks really good. Funny…just saw this recipe last week in the comments section of another food blog. I made it on Sunday and it was the most delicious and easiest roast chicken I have ever made. Awesome timing! I’m glad to hear that someone else had a good time with the recipe. Wow, that looks amazing! I can’t wait to try this! That’s too funny. Tried this a couple days ago because I didn’t want to use the crockpot for soggy skin. And we were going out for the day. So delicious!! I made this yesterday, and it was delicious! My husband said it was on par with a rotisserie chicken (high praise from him – he loves those things). He also said this should now be my go-to roasted chicken recipe. I agree, since it was tasty and incredible easy. Thanks! Sweet, let me know how you like it! Russ- Seriously the best chicken ever!! Kianna, awesome, glad you liked it! I’m trying this recipe today. I’ve had my chicken in the oven for 3 hours no and there are absolutely no juices in the dish. I am cooking in a glass baking dish. I am very surprised. I followed the recipe exactly. Maybe that means all the juice is staying in the bird which is a good thing? I just don’t want it to turn out dry. Any feedback on this? OK…..nevermind!! Ha. I went into the kitchen shortly after typing my comment, opened the oven, and there was suddenly juices in the baking dish. All is well. Can’t wait to eat this yummy bird!! Hi Jamie, sorry to reply so late. How did the chicken turn out? Made this for the second time tonight. This time I did not let it rest over night and added 2 minced cloves pv garlic in the cavity. Same great taste! Don’t waist the bag lol. Jesse, good to know! I plan on experimenting with this recipe in the future, and the whole overnight marinade thing is definitely up for reconsideration. 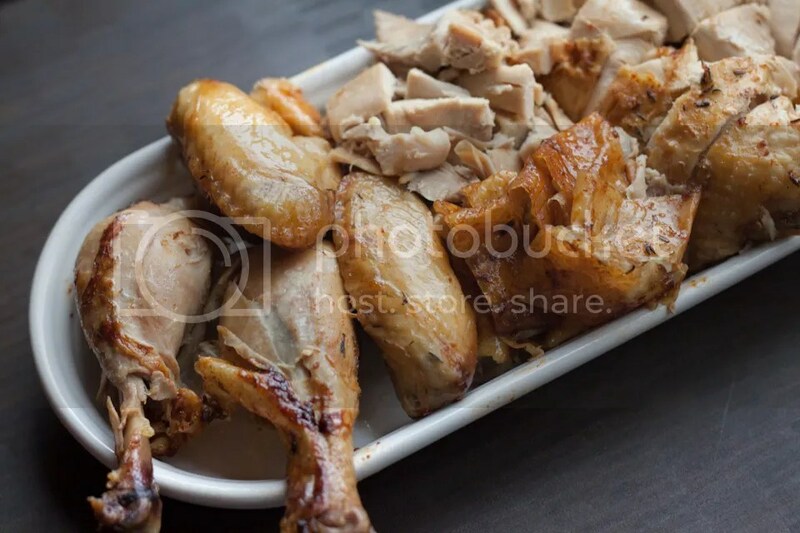 I was surfing the web for a different roast chicken recipe and found this one. I liked the picture of the end result. No butter, no oil, low temperature..so different from other recipes so i decided to try it.. I didn’t think enough ahead to prep the chicken the night before, so all I did was clean it, dry it and season it. From the second hour I was removing several tablespoons of juice to a separate saucepan that had the strained giblets I parboiled earlier.—in case I needed it later (didn’t!) and to make a gravy. In the last two hours I added some sliced carrots. By the 4th hour, the juices were really accumulating–and I kept basting and spooning lots more of the drippings into the sauce pan. Where are the drippings from. ?..there’s no oil, no butter–just the chicken. The skin was already very golden–I was pleasantly surprised , it looked done, but it wasn’t done yet. Needed another hour–the chicken weighed over 5#. I think it was a bit overcooked at 5 hours. 4.5 wouold have been perfect. Meat was incredibly juicy, falling off the bone. Not a smidgen of meat wasted. Kept the drippings for left overs. 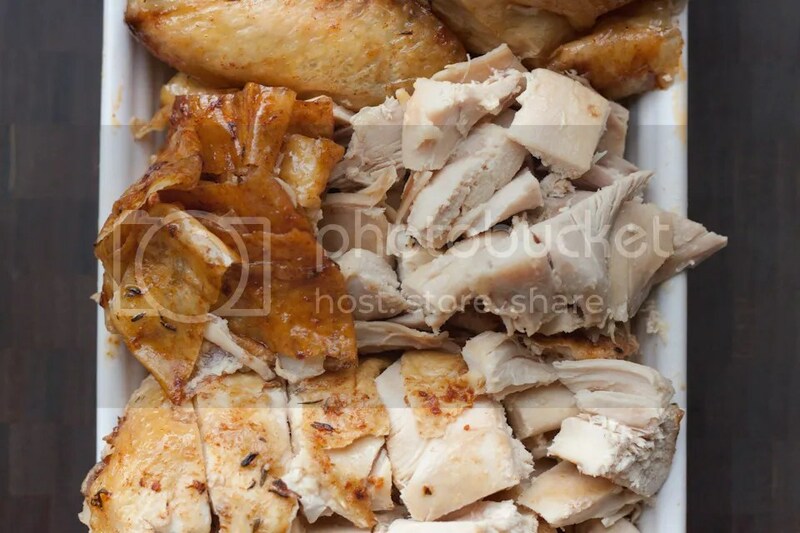 Tjis is my favorite roast chicken—if you have the time! . I was wondering how many pounds was your chicken? I really want to try this recipe but mine is a little over 7 lbs. Should I adjust the cooking time? I don’t want it to be cooking for 8 hours lol. What would you recommend? I also reuse my Ziploc bags. Admittedly, I would not use one after marinating chicken but certainly would marinate chicken in a bag that had been used and washed previously. I have turned to using glass containers so much more recently that I don’t even buy a box of Ziploc bags very often anymore. I make this all the time and have for 15 years. I put a lemon in instead and often out the bird in the oven before I go to work and set the oven to turn itself on. Lovely. Over the years of using this recipe, we have adapted it. Use bone-in thighs. Same ziploc treatment. Put in a pan and cover with foil, bake same 4 hrs. Pull out at the end and put pieces under the broiler to crisp the outside/skin up. Awesome and easy.